Transformation towards transaction-focused business continues. New issue announcement, application for quotation of additional securities and agreement. We are executing a transaction-focused strategy, positioning the business for strong growth in FY18. Pursuant to ASX Listing Rule 3.13.2 and section 251AA of the Corporations Act 2001 (Cth), the results of the Annual General Meeting held today and details of proxies lodged are set out in the attached schedule. Real Estate Investar Group Limited (ASX: REV) advises, pursuant to ASX Listing Rule 3.10A, that 29,226,192 fully paid ordinary shares will be released from escrow on 10 December 2017. On 20 September 2017, Real Estate Investar Group Limited (ASX: REV)) (Company) announced to the ASX a 1:5 non-renounceable entitlement offer (Entitlement Offer). Non-renounceable rights issue of 1 New Share for every 5 Shares held on the Record Date at an issue price of $0.04 per New Share to raise up to $777,350 (before costs) made pursuant to section s.708AA(2) Corporations Act 2001. Further to the Company’s announcement on 20 September 2017, the directors of Real Estate Investar Group Limited (ASX: REV) (“REV Group” or “Company”) are pleased to confirm further details of the Company’s 1 for 5 non-renounceable entitlement offer (Entitlement Offer). Real Estate Investar welcomes new cornerstone investor through concurrent placement and entitlement offer. Real Estate Investar Group Limited (“REV Group” or “Company”) (ASX:REV), a provider of integrated online products and services to Australian and New Zealand property investors, is pleased to release a company update presentation, which is attached to this announcement. Real Estate Investar Group Limited (“REV Group” or “Company”) (ASX:REV), announces that Mr Antony Catalano, has given notice of his resignation as a Director of the Company, effective today. The Real Estate Investar Group Limited (“REV Group” or “Company”) (ASX:REV), a leading online provider of data driven investment property analysis, tracking and transaction services to Australian and New Zealand property investors, has released its Appendix 4E Preliminary Financial Report for the 12 months to 30 June 2017 (“FY 2017”). Under ASX Listing Rule 4.3A. Reporting period (“Current Period”). Year ended 30 June 2017. 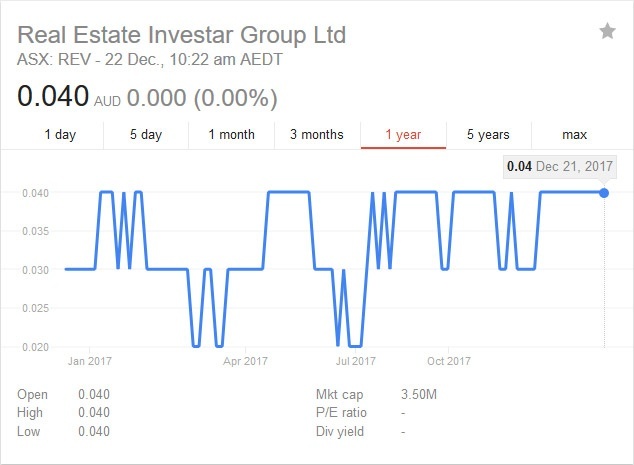 Real Estate Investar Group Limited (“REV Group” or “Company”) (ASX:REV), a leading provider of data driven investment property analysis, tracking and transaction services to Australian and New Zealand property investors, has released its 4C statement for 3 months to 30 June 2017 (“Q4 FY 2017”). Real Estate Investar Delivers Strong Growth in Third Quarter – Revenues	and	Cash Receipts Increased 60% Year on Year. Quarterly report for entities subject to Listing Rule 4. Half-year information given to ASX under listing rule 4.2A. Real Estate Investar Delivers Strong Growth in Revenue, Cash Receipts and Membership During First Half of FY 2017. Real Estate Investar Achieves 250,000 Member Milestone. Market Update 17 November 2016 (ASX:REV). Appendix 4E. Preliminary final report. Real Estate Investar Group Limited (“REV Group” or “Company”) (ASX:REV), a leading provider of online services to Australian and New Zealand property investors, has released its Appendix 4E Preliminary Final Report for the 12 months to 30 June 2016. Real Estate Investar Group Limited (ASX:REV), the leading provider of online investment services to Australian and New Zealand property investors, has signed an agreement to acquire the assets of The Property Factory Limited for NZ$550,000, payable in cash on completion. The Real Estate Investar Group Limited (ASX:REV) has entered a new partnership and distribution agreement with major shareholder Domain. The Real Estate Investar Group Limited (ASX:REV) has released its half year financial report for the six months ending 31 December 2015. Real Estate Investar Group Limited (ASX:REV) has released its 4C quarterly cash flow statement for the quarter ended 31 December 2015. The Real Estate Investar Group (REI Group), a leading provider of online services to Australian and New Zealand property investors, will make its debut on the ASX on Thursday 10 December 2015 under the ticker code REV. © Copyright 2019 Real Estate Investar Group Ltd. All rights reserved.